Insulated side-hinged garage door leaves are constructed of double skin steel sections filled with Freon-free PU foam. The doors leaves are fitted with our unique extruded aluminium ’h’ section profile which also contains tubular rubber seals. Because of this, the garage door has a perfect all-round perimeter seal to the frame, thus resulting in a comfortable environment inside your garage, and keeping the weather out. To eliminate draughts and keep the elements out our ‘P’ section side hinged door frames are rebated to fit the leaves. We construct it from 2mm thick steel with mitred corners and welded for strength. Furthermore, these are zinc coated, primed and powder coated for extra durability. Also we offer a large variety of frames and thresholds including custom made. We connect the leaves to the frames using high quality stainless steel hinges. Each hinge is equipped with a roller bearing for a smooth opening and closing action. Side hinged garage doors seems like a good choice if you use the garage as either an office space, a workshop or simply for storage. We can design side hinged garage doors to replicate existing traditional looking doors. This is especially important for conservation areas where the new door must maintain the old garage door design. We can manufacture bespoke side hinged garage doors for your opening. Maximum opening sizes of 10 feet wide and 8 feet high. However we can make larger size doors – please contact us for feasibility. We offer 14 sections’ designs and can paint them any RAL or BS colour. Furthermore – smooth surface panels can be painted with metallic or structured finish and gloss up to 90%. Combining different colour or design sections and stainless steel windows on one door can create a stunning door look. Also, glazed panels are the perfect option for workshops and offices. Save on electricity bills by letting natural sunlight in. 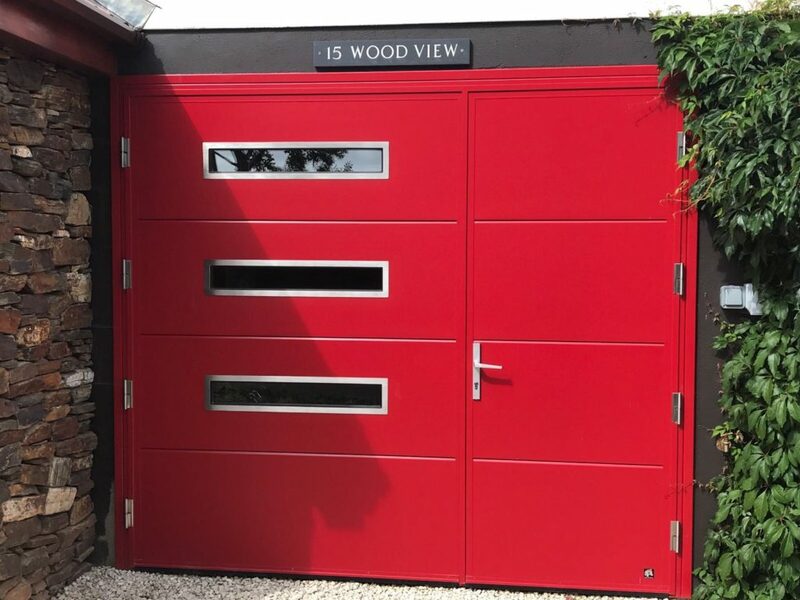 Finally for the more demanding customers we offer a range of bespoke or custom made side hinged garage doors including: Stainless steel, Okoume & Slim-line designs. For really exceptional curb appeal!